They say many things, often taxi drivers are waiting at the airport. 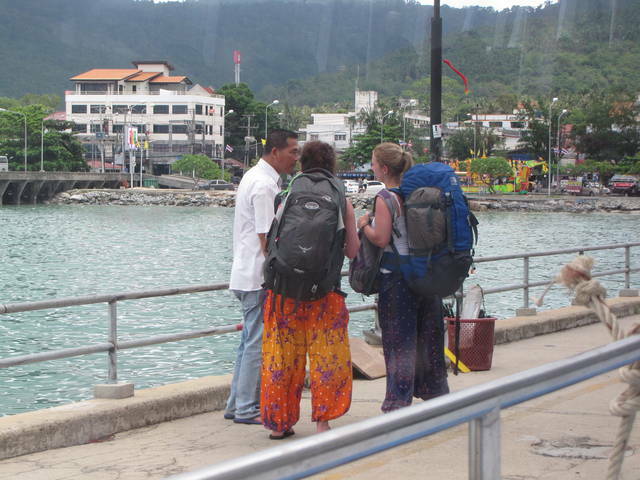 Two innocent and naive girls talking to the "Used Car Salesmen" of Travel at the dock on the Island of Koh Samui, Thailand. My advice is this, listen, be respectful and keep walking, whatever you do with the person, you will be volunteering for the 20 percent "Naive Tourist Tax." Whatever you do with these people is naive, you are being a naive tourist. I am not saying I never use them, but experience does help one learn out to separate the good advice from the bad. As a rule of thumb, do not talk with them, if you need advice, talk with others foreigners walking by, the locals only see you as a dollar sign.